I was planning on a light hack for last night. The horse’s get Mondays off, so Tuesday is usually a getting back in the groove day for Rio and I. I didn’t want to waste the opportunity to jump in relatively cool weather when some light storms blew through in the afternoon and dropped the temperature 10 degrees. With Rio still not wanting to sweat much, it’s MUCH easier on him to go when it’s cloudy, breezy, and 84 out. Knowing that trainer Julie already had a lesson scheduled for 6:30, I texted her seeing if I could join in. That lesson was already full, but she offered me a private at 5:45. I have actually been wanting to take a private lately, to really focus on my timing of the aids with Rio so I jumped at the opportunity. I still need someone to tell me when to package him more in the canter, and when to release, as I do not have the feeling of the perfect canter cemented in my mind yet. At this point, Rio is progressing faster then me (thank you training rides!) and I need to make sure I’m keeping up with how he needs to be ridden. It’s not that he’s difficult, he’s actually way more broke now. It is more that he is doing so well lately that I need to be sharper and clearer with my communication to him to get the best quality work possible. 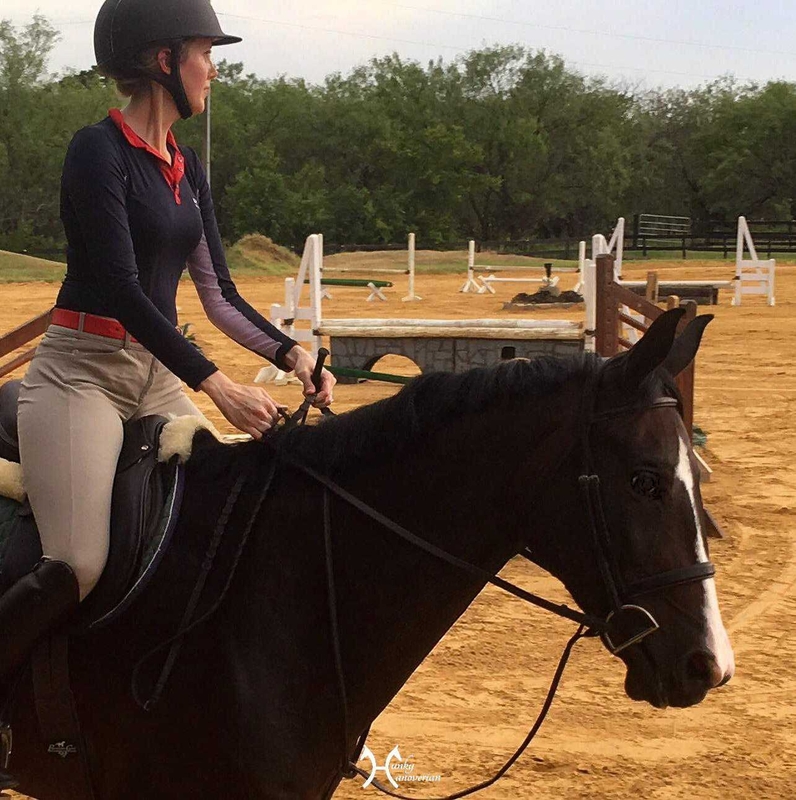 It kind of feels similar to moving up the levels in dressage. 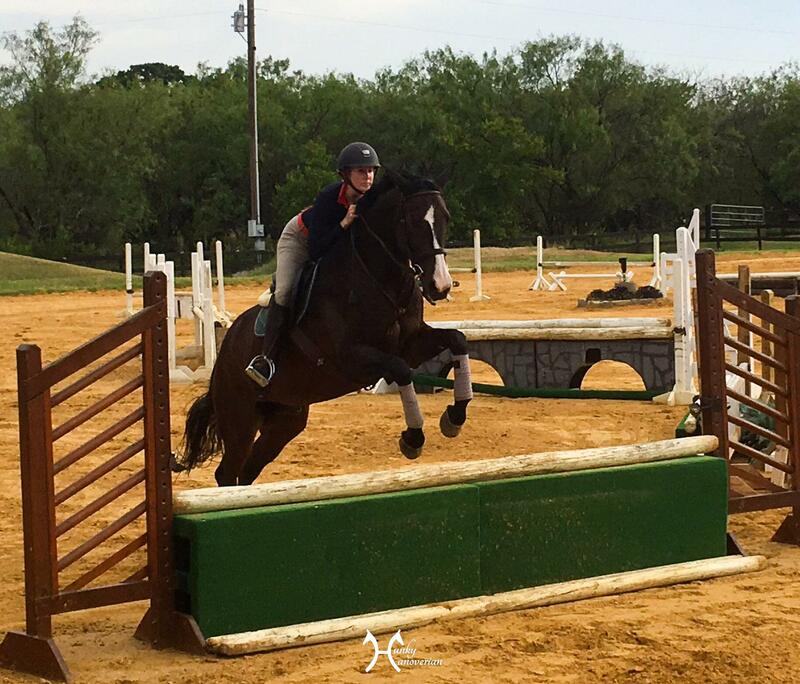 As your horse becomes better educated, you as the rider have to be clearer about what you want, because you have so many more tools in your toolbox. 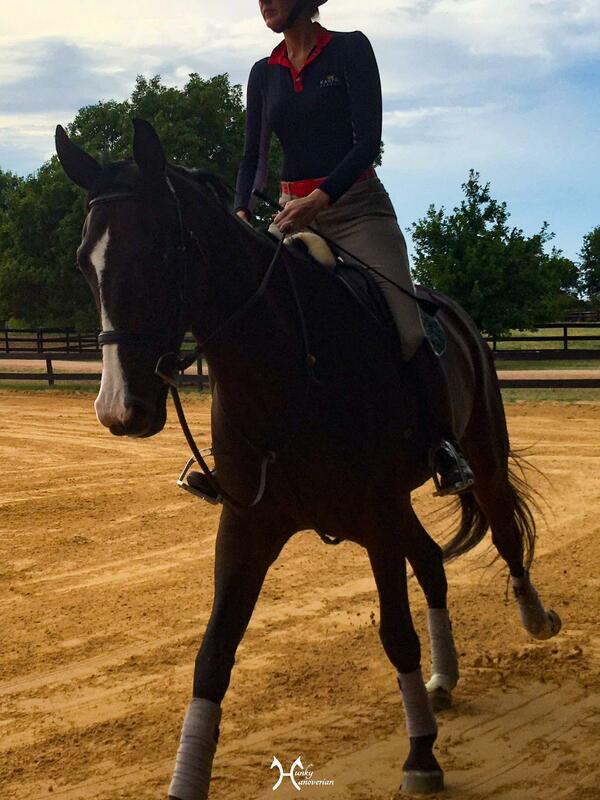 If I want Rio to canter ‘just so’, then I need to clearly ask for that specific canter, and make sure it is black and white. We also talked a lot about my position. I can get stuck a bit too forward with my upper body, and I need to remember to open up my hip angle when I am asking him to come back to me. Sometimes that is all it took, me sitting up straighter, so get him to tone down the canter a notch. Our lesson was excellent! 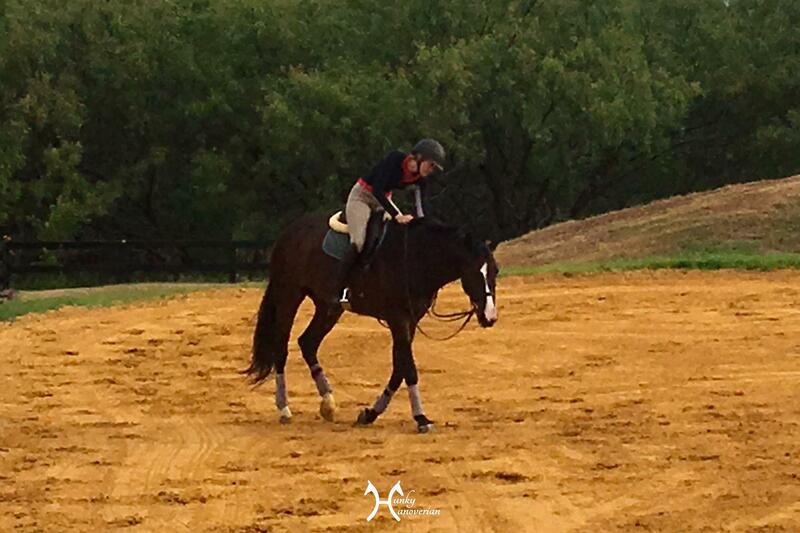 With continuous coaching from Julie, I was really able to tell Rio exactly what to do, without over riding him. Julie kept reminding me to let go, get soft, and allow him to make mistakes. Only one time did he take advantage and trot before a small vertical instead of rocking back and doing the soft add. Other then that, he was a super star the whole ride. Even when we got quite deep going into a line, he easily added it. In the lines, I actually had to push a bit to get the strides, which is a very new feeling! I also tried the new bit last night. I wrapped it in Sealtex (thanks for the recommendation Amelia!) so it would feel similar to his HS Duo. I really liked the way he went in it!! 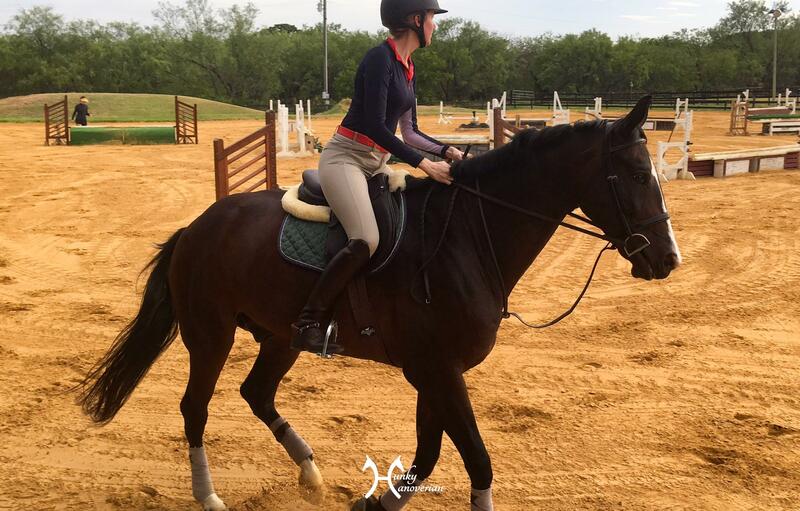 He felt the same during our warm-up (which was a good sign), and then once we starting jumping and really working on his canter I felt like I could be subtler with my corrections to get the desired response, versus what I was having to do in the Duo bit during my Sunday lesson. Trainer’s Julie and Stacie will have to see what they think of him in it, so they jury is still out, but so far so good.